Pelham /pɛləm/ is a suburban town in Westchester County, New York, approximately 14 miles northeast of Midtown Manhattan. As of the 2010 census, it had a population of 12,396. Historically, Pelham was composed of five villages and became known as "the Pelhams". Pelham currently contains two independently incorporated villages: the Villages of Pelham and Pelham Manor. Approximately 28 minutes away from Grand Central Terminal by the Metro-North Railroad's New Haven Line, Pelham is home to many New York City commuters and has an active social community for its residents. The Bronx–Whitestone Bridge is approximately 8.5 miles (14 km) south of the town. It is also 13 miles (21 km) northeast of LaGuardia Airport and 19.5 miles (31 km) north of John F. Kennedy International Airport. According to the United States Census Bureau, the town has a total area of 2.4 square miles (6.2 km2). It is directly north of the New York City borough of the Bronx and borders Eastchester, New Rochelle and Mount Vernon. Pelham's southern border abuts a small portion of the borough of the Bronx, commonly called "Bronx Manor". The area is named for the borough and the village of Pelham Manor. As of the 2010 census, this small area consists of 1,444 residents living on nine residential streets: Split Rock Road, Lincoln Avenue, Ropes Avenue, McOwen Avenue, Hutchinson Avenue, Flint Avenue, Hollers Avenue, Boston Road, Pelham Bay Park West, and Good Place. Pelham Bay Park is located immediately south of Bronx Manor. This 250-foot-wide (76 m) strip of land is technically located in the Bronx, and properties are taxed accordingly at Bronx rates. Bronx Manor residents have a New York City address with a Westchester telephone area code and exchange (914-738), and Pelham ZIP code (10803). Residents of Bronx Manor are eligible for political jobs for which a New York City residence is required. Bronx Manor is served by the MTA Regional Bus Operations' Bx16 route. Students residing in Bronx Manor are zoned for Pelham/Westchester public schools, per a 1948 contract between New York City and Westchester County. Bronx Manor includes Glover Field, the playing grounds for the athletic teams of Pelham public schools. Bronx Manor is served by the fire and police departments of Pelham. In 1654, Thomas Pell bought the area within the present-day town from the Siwanoy Indians. He named his manor "Pelham" in honor of his tutor, Pelham Burton. Pelham was incorporated as a part of the Bronx in 1788. It included all of City Island and present-day Pelham Bay Park east of the Hutchinson River. In 1889, the town was incorporated at its current boundaries. In 1891, the village of Pelham Manor incorporated. In 1896, the village of North Pelham and the village of Pelham incorporated. In 1975, the villages of North Pelham and Pelham merged, forming the present village of Pelham. The Village of Pelham and the Village of Pelham Manor share several services such as school and recreational activities. There is a grassroots movement to continue the consolidation of services in order to reduce taxes. The Pelham Picture House was added to the National Register of Historic Places in 2010. St. Catharine's was originally a mission church of St Gabriel's parish in New Rochelle. In July 1896 a frame church was built in the newly incorporated village of Pelham on land donated by Mr. and Mrs. Patrick Farrell. In December 1897 St. Catharine's became a separate parish with Rev. Francis P. McNichol as first pastor. A school was established in 1904, staffed by the Sisters of St. Francis. At the end of the school year in 1983 St. Catharine's School closed bringing to an end 75 years of Catholic education in the parish. The school building was converted to a Parish Center to provide space for Religious Education classes, parish activities and groups to meet. A new church was dedicated in 1909. In 1936 W. T. Grant, who owned a chain of five-and-ten cent stores, gave property in Pelham Manor to St. Catharine's to serve as a separate “mission”. The mission evolved to become Our Lady of Perpetual Help parish, with its own church building. In 2014 it was announced that the two parishes would merge, with the newer, larger Our Lady of Perpetual Help building designated as the parish church. However, St. Catharine's Church in the Village of Pelham was retained as a worship center. As of the census of 2000, there were 12,107 people, 4,149 households and 3,190 families residing in the town. The population density was 5,523.4 people per square mile (2,130.9/km²). There were 4,246 housing units at an average density of 1,976.4 per square mile (762.5/km²). The racial makeup of the town was 87.33% White, 4.57% Black or African American, 0.08% Native American, 3.96% Asian, 1.82% from other races and 2.23% from two or more races. Hispanic or Latino people of any race were 6.02% of the population. There were 4,149 households out of which 41.3% had children under the age of 18 living with them, 64.4% were married couples living together, 9.7% had a female householder with no husband present and 23.1% were non-families. 19.4% of all households were made up of individuals and 8.3% had someone living alone who was 65 years of age or older. The average household size was 2.86 and the average family size was 3.31. In the town, the population was spread out with 28.6% under the age of 18, 5.1% from 18 to 24, 28.3% from 25 to 44, 25.1% from 45 to 64 and 12.9% who were 65 years of age or older. The median age was 38 years. For every 100 females, there were 93.4 males. For every 100 females age 18 and over, there were 86.9 males. The median income for a household in the town was $91,810 and the median income for a family was $112,339. Males had a median income of $74,760 versus $46,086 for females. The per capita income for the town was $51,548. About 2.2% of families and 3.7% of the population were below the poverty line, including 4.3% of those under age 18 and 3.2% of those age 65 or over. Pelham is home to four elementary schools (two located in each village), one middle school, and one high school. The elementary schools are Hutchinson, Colonial, Siwanoy, and Prospect Hill. Pelham Middle School and Pelham Memorial High School gather students for all of Pelham. These are all part of the Pelham Union Free School District. There are also several private and religious based schools. Since 1948, New York City has paid the district to educate children who live in Bronx Manor, as doing so is less expensive than sending school buses there. The Village of Pelham Fire Department has 10 firefighters and five lieutenants, using one fire station. The fleet has two engines, one ladder, one utility unit, and a command vehicle. The Pelham Fire Department responds to approximately 800 emergency calls annually. On Amtrak, Pelham is located closest to the New Rochelle station ("NRO") on the Northeast Corridor. On Metro-North Railroad, the Pelham station is within Fare Zone 12 on the New Haven Line. Pelham is also about 28 minutes from Grand Central Terminal. Major employers in Pelham include Pico Electronics, Barksdale Home Care Services Corp., Pelham Public Schools, the New York Athletic Club, and the De Cicco & Sons grocery. Other companies based in Pelham include Archie Comics. ^ a b "Town of Pelham". Retrieved 2009-05-01. ^ "Profile of General Population and Housing Characteristics: 2010 Demographic Profile Data (DP-1): Pelham town, Westchester County, New York". U.S. Census Bureau, American Factfinder. Retrieved November 15, 2011. ^ a b c d Gross, Jane (1997-05-06). "A Tiny Strip of New York That Feels Like the Suburbs". The New York Times. Retrieved June 9, 2012. ^ a b Bell, Blake (2008). "Town of Pelham History". Town of Pelham. Retrieved 2009-05-01. ^ ""Parish History", Our Lady of Perpetual Help-St. Catherine Parish". Archived from the original on 2016-12-02. Retrieved 2016-12-01. ^ "Historical Weather for New York, United States of America - Travel, Vacation and Reference Information". Canty and Associates LLC. Retrieved 2012-06-11. ^ "Pelham Westchester County New York average temperature, sunshine and precipitation data". Homefacts.com. Retrieved 2012-06-11. ^ "Monthly Averages for Pelham, NY (10803)". The Weather Channel. June 2012. Retrieved 2012-06-11. ^ a b "Community-Schools". Retrieved 2009-05-01. 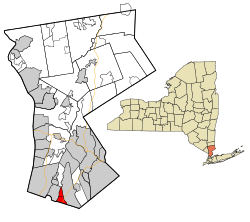 Wikimedia Commons has media related to Pelham, New York. This page was last edited on 23 November 2018, at 05:15 (UTC).